A drive around any older neighborhood will quickly show you giant trees right up against houses, blocking windows, damaging foundations and drains, and making rooms dark and gloomy. Bad decisions about planting distances are easy to find, so why are they made? The biggest single reason for poor tree placement is the way we see plants as cute and small, and our wish to surround our homes with green. But the consequences, in removal costs, damage, insurance claims, and in the forced cutting down of heritage trees, are serious. Trees take time to grow, and many can and do grow large, so when planting a tree it really is worthwhile to take some time, and use a measure tape, when choosing that planting spot. Don’t get caught out 20 years from now by a hasty choice of tree species, or planting spot. There is a common idea that the roots of trees extend to the ‘drip line’, the place where the foliage ends. 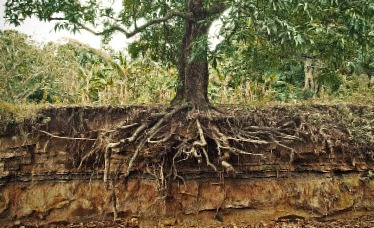 The image of the root-system being an upside-down version of the branches is very wrong, because for almost all trees the roots extend 1.5 to 3 times the height of the tree. A sixty-foot tree will therefore have some roots over 150 feet from the trunk, but those outermost roots are small feeding roots – usually not the large structural roots that cause damage. The depth of roots, on the other hand, is much less than the height, although this is affected by the soil. Deep, sandy soil allows roots to penetrate downwards 10 or 20 feet, but many soils have hard clay or rock just a few feet down, and that effectively prevents deeper rooting – as is seen when a tree blows over in a storm. How far the roots will spread, and how badly they might affect drains and foundations, depends not just on the ultimate height of the tree, but on what kind of tree it is. The most well-known of these aggressive trees is the Weeping Willow, but all willows that grow large can be a problem. Other trees with similar habits include cottonwood, aspen and any other poplar trees, silver maple, Norway maple, black locust and American elm. These trees should be planted 100 feet from any buildings, drain pipes, sewers or swimming pools. Don’t forget to consider your neighbors home and pipes too. On the other hand, most conifer trees – like spruce, Thuja and pine – have more fibrous, shallow root systems that rarely cause problems. That is why they are popular choices for lawn specimens, hedges and screens. But just because they don’t create damage doesn’t mean they won’t get too big for your garden, and evergreens are especially bad for blocking light. Planting trees too close to a building – your own or your neighbors, or a property line, can end up costing you plenty of money. So can choosing a tree that is too large for your property. The removal of large trees, especially in confined spaces, is expensive. So is ripping out sewer lines and replacing them. 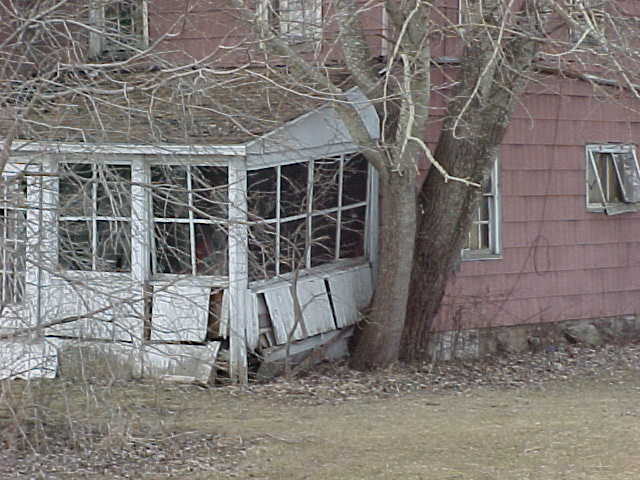 If your tree invades your neighbor’s lines, or damage their foundations, you will be left facing the bill for its repair. Tree experts can pin-point, through root examination, exactly which tree is doing the damage, and you may not like what they find. Neighbors can force you to remove a tree that is, or could, be damaging – at your expense. Tree trimming to remove dangerous over-hanging branches is expensive too and may need to be done regularly. Many people plant large trees, thinking they can leave any problems to future owners, but trees that are, or could become, dangerous problems will reduce the re-sale value, so you do end up paying for your own mistakes. How Much Room Should I Allow? With all these considerations, when you are looking for trees to plant, look at the final sizes listed for them and then get out into the garden with a measure, to see how much room you really have, considering all the things we have talked about here. Look at the places you were thinking of planting and consider the following distances. Small trees, such as flowering dogwoods, magnolia, or smaller conifers – allow 10 feet. There are other factors worth considering when planting near your home, besides protecting foundations. First there is visual scale. A typical two-story home, with a pitched roof is 20 to 25 feet tall. Many trees, evergreen or deciduous, will grow 60 to 80 feet tall, and right alongside your home that is going to look pretty silly. Besides that, overhanging branches can break, causing roof damage, or if the whole tree comes down in a storm it will demolish most of your home. Far better to plant trees that grow no more than 40 feet tall within a 20 feet radius around your home. Keep those larger trees further away, where you can see and admire their beauty, without any risk. Consider too the width of the tree. As a rule of thumb, if you half the width listed for a mature tree, that should be the minimum distance away from the house – even then the branches will in time touch the windows. So a better rule would be two-thirds of the listed width. That is also a good rule for spacing trees apart, if you want them to retain their individual identity. Trees planted close together make a nice forest, but that may not be the garden style you had in mind! If you are planting a larger tree, where will the shadow fall? Roughly speaking, a tree will cast a shadow equal to its height by mid-afternoon in mid-summer. That shadow will be to the south-west of the tree. In winter the shadow will be much longer, which is why large evergreens are not good choices near a house. On the south side of your home, a deciduous tree may cast welcome, cooling shade in summer, and let warming sunshine through in winter – a much better choice. All of this doesn’t mean you shouldn’t plant trees – with all the joy and beauty that brings. It does mean you should choose wisely. Today we have many smaller versions of full-size trees available, plus all the trees that stay small naturally. There are many, many good choices available, depending on your circumstances, so plant away – just give some thought before you do it. If you really do want a specimen of a giant redwood in your courtyard garden, there is always bonsai!